Down a desolate corner of 16th Street, beside the no-man's-land walkway lining the West Side Highway, is a building that was once the annex to the Nabisco Factory. Like most of the edifices in this part of town, it once served as a mundane place for food manufacturing and has now become a place for revelry, for splurging on fancy dinners and following the excess with drinks somewhere dark; somewhere with exotic, strange interiors. There's an architectural uniformity here, and it makes for the ideal neighborhood of naughtiness. Most of the reclaimed space in the Meatpacking District — the sliver-sized edges of factories, the meat racks, the steel garages — makes for slightly sinister-looking nightclubs. However, as I approached that corner of 16th Street by the highway, the streets slick with rain and in the air a frightful chill, I did see one last place that actually stores and ships meat, and it was the peak frenzy period of getting it all out. Trucks circled men in hardhats with enormous parcels held over their heads. There was a lot of yelling and it smelled rank. A small car lift almost knocked the cigarette out of my mouth. This image stayed with me, this image of the nascent utility of this cluster of blocks near the Hudson River, as I approached the latest boite that has turned scraps of factory space into a trendy sin den: backbar, hidden behind the restaurant Toro. Last Wednesday I walked into backbar for its opening, and from the looks of the bash that accompanied it, it will be a new essential checkpoint in a night out in New York. It's in an intriguing triangular space, lit sparsely but tastefully, with an industrial-looking naked concrete wall nodding to the building's past. 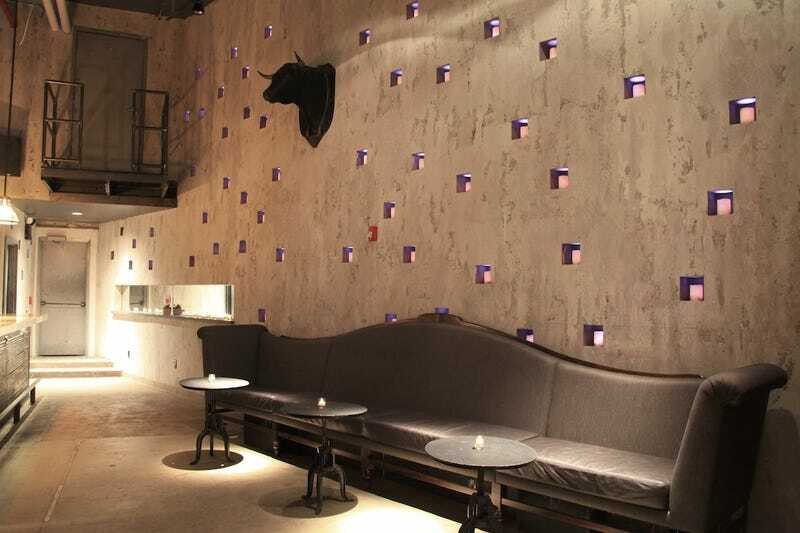 The bull's head on the other wall is probably not a reference to the Meatpacking District's ostensible purpose, but rather a reminder that you return during the earlier hours to dine at Toro. The tree in the other corner, vines spewing toward the ceiling — I'm not sure why that's there. Cars lined up outside the secret entrance as the hour passed from ten to midnight, and then later. Rose and tequila were the drinks being served, and no one noticed that such adult beverages are wildly inappropriate given the season. After a few more glasses of each, no one seemed to notice much of anything. I left the room with it still packed, the evil-seeking men of the night having found their newest venue of choice. Nate Freeman is the Editor-in-Chief of Good to be Bad. His writing has been published in The New York Times, The Wall Street Journal and The New York Observer.